The ERI group outscored the modified Reading Recovery group and the Control group on the Nonsense Word Test of the DIBELS. The higher score on the Nonsense Word Test of the DIBELS may be due to the heavy emphasis on phonology, therefore indicating a lack of balance in literacy instruction. An observational checklist analyzing students' attentional abilities in the classroom during the literacy block was completed on each student at the beginning, in the middle, and at the end of the twelve-week period. The average growth in attention for the ERI group for the twelve weeks of the study was 2.50 points. The average growth in attention for the modified Reading Recovery group for the twelve weeks of the study was 8 points. The average growth in attention for the Control group for the twelve weeks of the study was 4.42 points. The modified Reading Recovery group made the greatest growth in attention during this study. The higher score in attention indicates that the students in the modified Reading Recovery group were more engaged in the literacy lessons occurring in the classroom compared to the ERI group and the Control group. This may have been due to the fast pace of the lesson, moving from practicing high-frequency words to familiar rereading to the new book to word work and finally to writing in a thirty-minute time frame. Although they did show improvement, from the pre-test (5.20) to the post-test (30.80), the modified Reading Recovery group did not do as well in as the ERI on the DIBELS Nonsense Word Fluency test. The ERI group's mean was 34.50 words words per minute. The average growth in nonsense word fluency for the modified Reading Recovery group was 25.60 words per minute. This may be due to the fact that, as students read, the teacher-researcher used various prompts to help students become independent readers. Some of these prompts allude to the fact that reading should make sense and sound right; i.e. "Does that make sense? Can we say it that way? Is that a real word?" (Click here to see teacher "Prompt Sheet.") Another reason for a lower score in this area may be due to the fact that the teacher-researcher had the students focus on using graphophonics, semantics, and syntax in a balanced manner, rather than just focusing on graphophonics as the ERI program does. As evidenced by the DRA, the modified Reading Recovery group improved the most in reading levels since the average growth for this group over a twelve week period was 6.20 levels. The reason for this growth may be due to the structure of the lessons for the modified Reading Recovery approach. In each lesson students reread a familiar book and a new book. Additionally, in each lesson there is a section focusing on learning and reviewing high-frequency words, a section on word work, and a section on writing. In each lesson, the students' strengths in writing are used to increase their reading strengths or vice-versa; the students' strengths in reading are used to increase their writing strengths. The approach used in the modified Reading Recovery approach is a balanced literacy approach. The DIBELS Phoneme Segmentation Fluency was another area in which the modified Reading Recovery group showed greater growth. The higher score on the DIBELS Phoneme Segmentation Test may be due to the writing segment of each lesson which involves Elkonin sound boxes as needed. The ERI lessons spent more time having the students move counters in sound boxes to segment sounds and no writing was involved. In the modified Reading Recovery approach the teacher-researcher had students attach letters to sounds as soon as possible by writing the letters standing for the sounds in the sound boxes on the practice page. The students then wrote the sound box words in their sentences on the writing page. 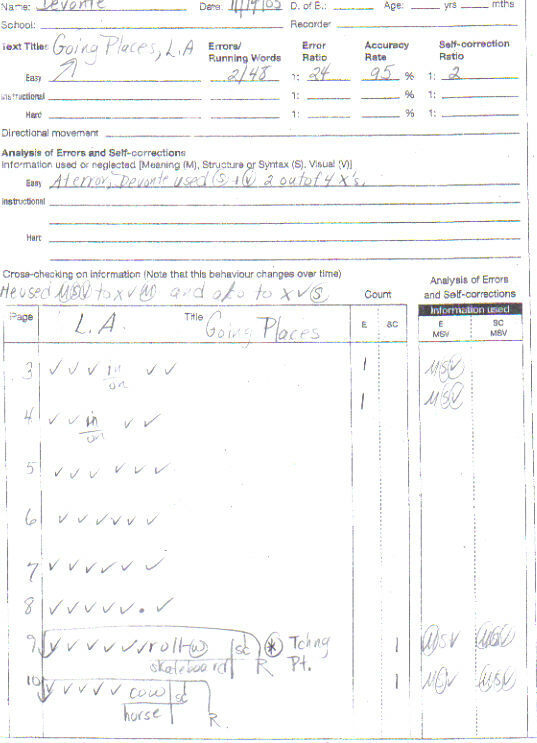 Additionally, at the end of the twelve weeks, the mean difference in scores on Clay's Dictation Test between the Control group and the modified Reading Recovery group was .89, while the mean difference in scores on Clay's Dictation Test between the Control group and the ERI group was 2.34. The broad goals for this lesson in reading are: to continue to build up students’ recognition of high frequency words and to help the students by using strategies such as sounding the first letter of the word and thinking about the story at the same time to try to determine the unknown word (cross-checking the cues representing semantics and graphophonics); to reread at difficulty and to self-correct. The broad goals in writing are to continue to build up high frequency words (spelling ability) and to improve on phonetic ability by continuing to use Elkonin sound boxes. Rationale: In order to become successful readers and writers, students need a common core of vocabulary they can read and write—high frequency words. Therefore, increasing high frequency words is one of the priorities of this lesson. Once a student can read and write about fifteen high frequency words, they can increase the number of known words through analogy. The use of Elkonin sound boxes also helps to increase the number of high frequency words a student has. Since research has also shown reading and writing to be interrelated components in improving literacy, reading and writing are components of my literacy lessons. If a child’s strength is in writing but not in reading, I use the child’s writing strength to improve his reading. If a child’s strength is in reading but not in writing, I use the child’s strength in reading to improve his writing. Students need to learn reading and writing strategies, such as cross-checking cues and rereading at difficulty and to self-correct, so they become self-extending readers who learn more about the processes of reading and writing by reading and writing. · Identify the author and title of a book, and use a table of contents. · Use knowledge of vowel digraphs and r-controlled letter-sound associations to read words. · read and write sentences by recalling known words, using letter-sound matches to decode and encode simple words, and match oral words to print. 1. Focusing on the high frequency words (sight words) can, here, and are, have the students practice writing the words you call out. 2. Have students do some word work with their boards and markers. This word work will emphasize using a word they know to help identify a word they don’t know. Use the following words and talk about the common chunk of letters the words have: can~man~fan~pan; he~we~me~be~she; Explain that they can use this same technique when confronted with an unknown word they can’t read or a word they can’t write. When confronted with an unknown word in reading, they need to think of a word they know that shares a common chunk as the unknown word. When trying to think of how to spell a word in writing, they need to listen as they say the word slowly and think what chunk they hear in the word that is shared by a word they know how to write. 3. Begin familiar rereading by having children partner read Going Places, Level A. Conduct a running record on Devonte as he reads the book. 4. New Book Introduction-- Students will now read the new book Bird Goes Home, Level A. Introduce this book by asking the students what they know about birds and the seasons. Depending on the students’ answers, scaffold the students’ background knowledge as needed in order for students to understand the book. --All silently read story to themselves. At this level, students will read aloud. The bird goes over the tree. In this sentence The is the high frequency word the students should know how to write. Students having difficulty remembering how the looks should write and say the five times on the upper portion of their writing books (the practice page), checking the spelling of the word(s) after writing. Goes should be practiced as a high frequency word. 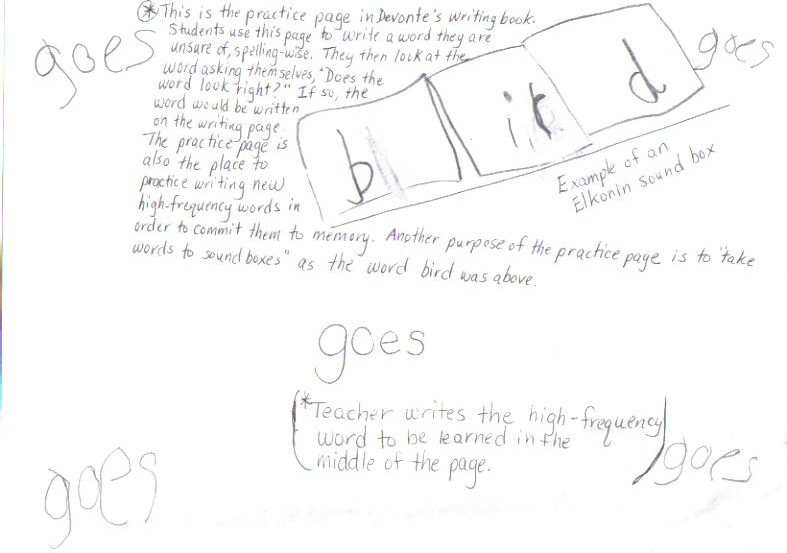 The word bird will be brought to sound boxes on the practice page in a similar fashion as the segmented activity in Lesson 1, Activity #4. Students will say over and tree slowly, listening for the sounds they hear and also using analogy to write the chunk –er in her to write over and –ee in see to write tree. Students will then write the sentence The bird goes over the tree. on the writing page of their writing books. Students will then receive the sentence The bird goes over the tree. on a strip of paper. The teacher will cut between each word as the students reads the word. To get the students to focus on using known chunks/words to help determine unknown words, the teacher will cut the tr in tree away from the ee in tree. As she cuts the tr in tree away from the ee in tree, she explains that she wants students to focus on using known chunks/words to help determine unknown words. Students will make the sounds for tr and ee in tree as she cuts. Then the teacher will mix up the letter and words and the students will put it together like a puzzle. The students will finally point and read the words in the sentence. This cut-up story will be homework for the students to practice putting together and reading at home. Throughout the lesson I observed each student in the group to determine if the student was grasping the concepts presented. If a student continued to have difficulty, I would help that student individually. If I notice a few of the students were having difficulty, I would create a spontaneous mini-lesson involving the area of difficulty. Reflection: The lesson went well. If I were to do this lesson again, I would have students write some words in the word family –ee on the writing practice page in order to reinforce using words we know to help us get unfamiliar words in reading and in writing. At the beginning of this project, the classroom teacher had wanted to refer one of the modified Reading Recovery students, Devonte, for special education services. She did not realize that Devonte's main problem was environmental. He lacked exposure to reading since he had never been read to. His father is Cuban and doesn't read English. His mother, although she had lived in the United States all her life, cannot read. In order to have Devonte understand what reading is and the enjoyment that reading can produce, this teacher-researcher involved Devonte in the Retired Senior Volunteer Program (R.S.V.P.). Each week an R.S.V.P. member reads to Devonte. One can tell Devonte enjoys being read to since he smiles the whole time the R.S.V.P. member is reading to him. Having had teaching experience with students who are learning disabled, this teacher-researcher quickly realized Devonte did not have any learning disabilities. Upon entering his classroom one day, this teacher-researcher observed Devonte sitting with over sixty letters in a box. The classroom teacher was having students put letters together to form the seven spelling words for the week. Devonte would methodically turn letter squares over in order to see them and was very focused on the letters he needed. At one point he turned to this teacher-researcher and said, "There are no more e's." This teacher-researcher went over to help and, looking through all of the forty plus letters which were left, determined Devonte was right. This teacher-researcher even commented to the teacher as to the terrific job Devonte was doing making his seven spelling words. Devonte's concepts of print are also definitely in place. It is good to know that Devonte was saved from being placed in a special education program as a result of the modified Reading Recovery approach. He has made so great progress since the beginning of this reading intervention. 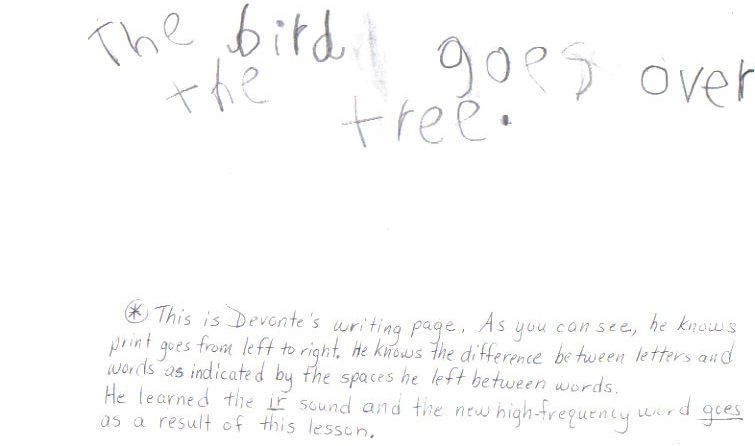 Devonte has gone from reading a less than kindergarten level to a Level 4, DRA. This is a six level improvement in twelve weeks. If this study were to be conducted again, this teacher-researcher would extend the time of this study from twelve weeks to the entire school year. It would be interesting to see long-term growth in reading levels and phoneme segmentation growth for both groups. Another area which might be considered if this study were to be conducted again would be the assessment of students' writing ability in terms of composition and convention as a result of exposure to either the modified Reading Recovery instruction or the Early Reading Intervention instruction. This teacher-researcher would also recommend moving the students in the modified Reading Recovery group more quickly through the levels than was done. Conducting running records on the students in the modified Reading Recovery group once every two weeks rather than once a month would assist the teacher-researcher in realizing when it was the opportune time to move the students to the next level of instructional text. --McGuinness (2004) who stated that phoneme-awareness training meshed with teaching letter-sound correspondences has a much stronger impact on reading and spelling than training in the auditory mode alone. --Hohn and Ehri (1983) who found that children need to attach letters to sounds as soon as possible. --Ball and Blachman (1988, 1991) who found that letters were more powerful aids to segmenting than blank disks when used in sound boxes. --Scanlon and Vellutino (1997) whose research implies that the best way to teach phonemic awareness and phonics is through writing, not through a purchased program. --Clay (1991) who found that directing attention to only one source of information used by the reader can produce problems since readers use meaning and syntax information in addition to visual information. --Bus & van IJzendoorn (1999) whose research supports a balanced perspective on reading instruction. Therefore, legislative proposals which mandate intensive phonics as the method to teach beginning reading are based upon some unwarranted assumptions. The costs and consequences of such legislative proposals are potentially harmful to many children in their efforts to become literate since these struggling readers will think that we read to decode rather than we read to understand the author’s message (Jones, 1996). Balanced reading instruction is what is needed for all students. Writing should be a component of all intervention lessons for struggling beginning readers since phoneme-awareness training combined with letter-sound correspondences produces the greatest growth in reading ability as shown by this study.